LA’s Koreatown is a place of legend, filled with all-you-can-eat BBQ, karaoke spots, and seedy places you’ll never know about unless you know about them. It also covers the area seemingly as big as Manhattan. New York’s Koreatown, on the other hand, covers just more than a city block and is built vertically like much of the rest of Manhattan. It is there that I went to dinner at Jongro BBQ. Walking into Jongro is like what I imagine walking into a market in South Korea is like, as the design gives off the impression that you are outside. The surprise for me, however, was the long ventilation tubes hanging from the ceiling over every table. This ensured that the place was well-ventilated and did not have the musk of other Korean BBQ places I have been to. In another strong contrast to LA’s Koreatown, everything seemed shiny and new. When we were seated, we ordered up some Marinated Kalbi and our waiter set to work. 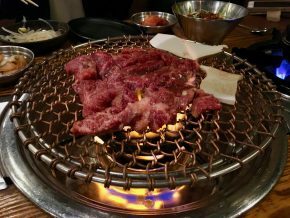 While there was a degree of DIY to this meal, the staff actually took care of almost everything – including retracting the ventilation tube when it was time to eat the meat off of the grate it was cooking on. As for the Kalbi, it was fantastic. Perfectly seasoned, super tender and cooked just right thanks to the waiter. At the risk of over-comparing, I have to admit that I am spoiled by Korean food in LA. Jongro was great, no doubt, and probably some of the best Korean that New York has to offer. Plus, the meat was on par with some of the better spots I’ve been to. The trouble that it was not all-you-can-eat, which is almost a prerequisite for me and Korean BBQ. And I don’t mean this in terms of gluttony, but just in terms of being able to try more than one or two different things in a meal, because variety is the spice of life (along with gochujang). Regardless, Jongro succeeds in bringing great Korean food to the mean streets of New York, and for that it is to be commended.